This listed property is a stunning historical home, oozing character and style, with a modern twist. It boasts many unique and exquisite features and the attention to detail to the interior and the external gardens can only be admired. The current owners have done a remarkable task in restoring the property from when they purchased it in the mid 1980s. It is evident throughout the house and grounds that no expense was spared when redesigning and decorating this home. It now boasts all the advantages of a modern property, yet still holds on to its character and history and really has excellent future potential. On entering the property, the tiled entrance hall is both welcoming and warm. The open plane kitchen, living room, and dining room oozes charm with its feature pitch pine flooring, panelled walls, oil-fired stove surrounded by original stone fireplace, and a variety of fitted pine units. There is also a shower room at this level and two double bedrooms and the current owners added a stunning sunroom to the rear of the property which is a complete suntrap and even though it is quite spacious, the heat and sunlight makes it one of the cosiest rooms in the house. There is vast of amount of glass in this room and the shape and design of this glass make it the focal point of the house. It boasts a high pine ceiling, Chinese slate floors, and with the south facing aspect soaks up the sun, whenever it shines. This relaxing room looks out on to the beautiful grounds and gardens which have been meticulously maintained. Leading up to the first floor, there is a landing area and three additional bedrooms, two of which have built-in wardrobes, and two of the bedrooms are en suite. The character of the home is evident in the master bedroom where the original fireplace with Liscannor hearth and tiled inset is still in situ. There are many wonderful features to this property including superb south facing aspect, French panelled feature pine doors throughout, magnificent Georgian windows, double glazing to sun room extension and secondary glazing to original house, electric central heating and oil fired stove, separate detached garage measuring approximately 247sq feet, with insulated walls, and the beautiful glass extension to rear of property with insulated roof. The property was re-roofed, using blue Bangor slate (as original ), approximately 25 years ago and the sun room extension was added with matching blue Bangor slate and insulated roof similar to the main structure. The old windows and doors were all replaced and there is an old turf shed to the rear of the property which was re-roofed with blue Bangor slate and extended to create a beautiful water feature. There is a newer detached garage which has insulated walls, and the garden has antique cast iron and stone features sourced from the midlands and antique gas street lamps sourced from England. 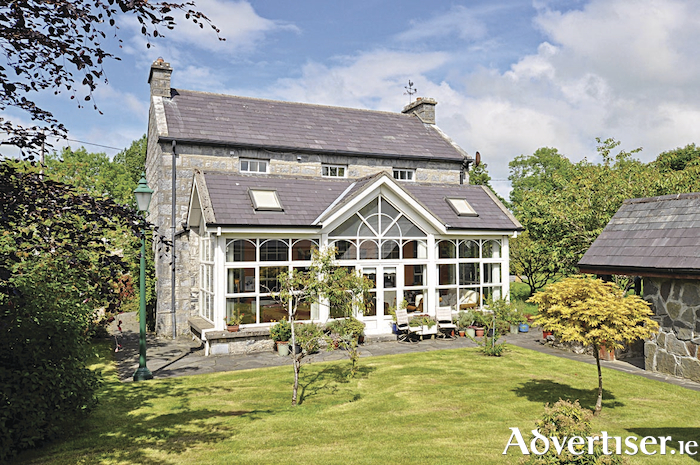 This property is a real jewel in the crown situated in the heart of Oranmore village. The current owners spared no expense in weatherproofing, restoring, and extending, bringing the property up to modern day standards. Guide price is €525,000. For further details or to make an appointment to view this property contact Lynch auctioneers on 091 566157 or Shane Cox on 087 9830450.